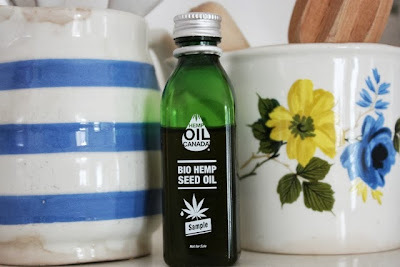 I was sent a sample bottle of hemp oil by HempSeedOil.eu and I tried it out in two salad dishes. Hemp seed oil is low in saturated fats, is a source of polyunsaturated fats, and is free from trans fat and cholesterol. The oil is of high nutritional value because of its 3:1 ratio of omega-6 to omega-3 essential fatty acids, which matches the balance required by the human body. Hemp oil is not really used in cooking, it's best used in dressings and dips and so on. I used mine to make a salad dressing with red wine vinegar and a pinch of salt and pepper (three parts oil to one part vinegar). The hemp oil has a lovely clear green colour and has the slightly grassy taste of extra virgin olive oil, though I thought it was milder than olive oil. It was a good substitute and, as I find the smell of olive oil nauseating sometimes, the hemp oil pleased me. I also used it to make the marinade for my Three Bean and Basil Salad, in place of olive oil, and it tasted great. I associate hemp with hessian type clothing and woven mats so it was interesting to see this oil and try it out. If you find olive oil too pungent for dressings (as I often do), you might find that hemp oil is a pleasant alternative. I love all things hemp-truly a wonder product! Even the bottle that the oil comes in is gorgeous! !